I’m just going to say this up front: If you ever get a chance to organize a conference as a graduate student, take it. It will be one of the best opportunities that you will ever get to work alongside people you already admire, and people whom you will come to admire. 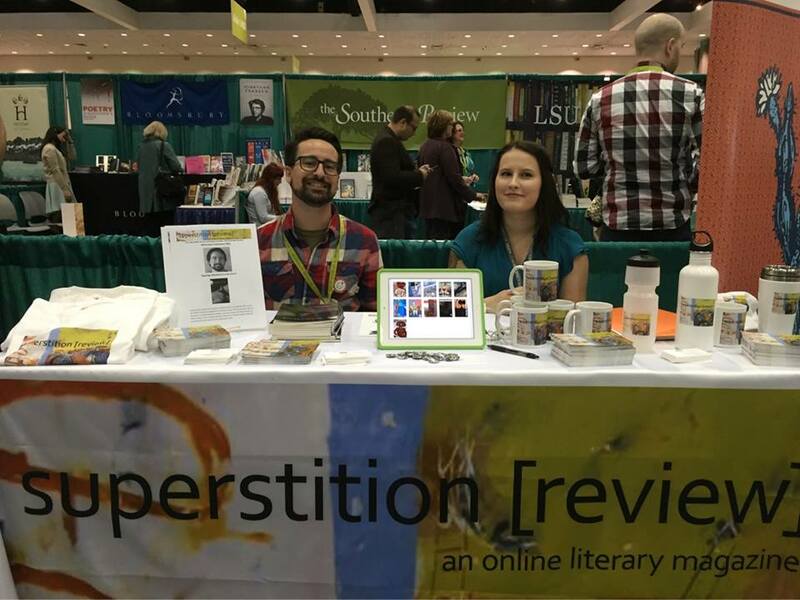 During my time with Superstition Review (SR), I coordinated the live Readings for the first and second issues (2008-2009), and I also read at one myself. For the readings, I coordinated and scheduled speakers, budgeted, set up refreshments, emceed, and practiced my professional tone in emails, phone calls, and on stage the night of the event—it was really an all-around position that demanded immediate poise and control in reaction to the various situations that could come up . The skills that I learned while organizing those readings would set me up for the rest of my academic career as someone who had experience in coordination, public speaking and administration, which are invaluable in the academic setting—think about where academe would be if Aristotle or Socrates were terrible at public speaking! After leaving ASU and SR after earning my Bachelor’s degree in Literature, Writing, & Film, I ended up back at ASU on the PhD student path after Master’s Degrees in Teaching English to Speakers of Other Languages (TESL) and Rhetoric and the Teaching of Writing from NAU. Through those years, I coordinated two other conferences, one of which I was able to invite my future PhD advisor to speak as the plenary speaker, and which eventually became the deciding factor about my PhD application’s competitiveness. Needless to say, I have been in my PhD program successfully for a year and a half, and have coordinated one of two international conferences that I have been invited by my PhD advisor to help coordinate. The first, The Symposium on Second Language Writing, which was in November 2014, was on our home turf—the Memorial Union on ASU Tempe campus. Before and during this conference, I met so many scholars whom I had admired for the past seven years. I also worked with many of my colleagues and superiors at ASU, learning just how much I valued their intelligence and organizing skills. I was given the opportunity (read: the challenge) to introduce my own advisor to a group of people who have known him for at least 15 years—an exhilarating experience trying to find something new to say about someone that everyone in the room already knew and admired. At least I felt prepared for the act of speaking in public, even if the content was hard to come by! This year’s SSLW was the best attended symposium on record, and according to the feedback we have received, the best one yet. The symposium gave me an excuse to interact with scholars whom I hope to work with in the future, and a context by which my name can hopefully be remembered. It strengthened the bonds between my colleagues and I, and I am so very proud of it. I will continue my work in conference planning as I am also currently a part of the planning committee for the joint American Association of Applied Linguistics (AAAL)/ Association Canadienne de Linguistique Appliquée/Canadian Association of Applied Linguistics (ACLA/CAAL) conference in Toronto, Canada. This conference will be a challenge as I am not in my own backyard anymore, and it is a much more diverse conference. However, from my experience working with previous conferences, and coordinating the readings for Superstition Review, I am confident that I will have the skills to make this conference valuable to all who attend. In my opinion, conferences, readings, or any in-person collaboration of people unified by the same cause are the most meaningful events in academe. I am deeply grateful to Superstition Review for instilling this mindset so early in my career, and I hope it has done the same for interns who came after me—as well as many more to come.